Bayfield County vital records are available from the Vital Records Office of the Wisconsin Department of Health in Madison ($20 by mail, fax, or in person) for records since statewide registration in October 1907. Vital records are also available locally at the Register of Deeds in Washburn and divorce records from the Clerk of Court. Bayfield vital records date from 1869 (marriage), 1870 (death), and 1879 (birth), but recordkeeping prior to 1907 is estimated to be only 50% complete. Historical records are available from the Register of Deeds or the Wisconsin Historical Society, with a statewide index available online. 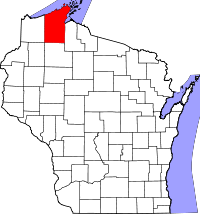 La Pointe County was renamed Bayfield in 1866.